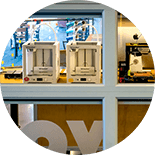 The Auraria Library Innovation Garage now provides high quality 3D printing, large format printing, and vinyl cutting services in support of project-based learning and research. These services were previously located in our MakeLab. The Innovation Garage also serves as a drop-in support space for multimedia projects. Our lab includes specialized software workstations and large format scanners. These services were previously available in the Digital Media Studio. We are located on the first floor next to the 10th Street entrance. Use the New Interactive Floor Maps to view where the Innovation Garage is located inside the library. The Innovation Garage was being used as an event space for the Fall 2018 semester. If you need a space for your upcoming event or meeting, please see our Discovery Wall page. Faculty, students, and staff are encouraged to make an appointment to use the digital imaging and multimedia equipment in the Innovation Garage. Support is available in-person, subject to staffing. Please note, the Innovation Garage is a support space, not a public lab. Patrons who are using the computers for non-support related work will be asked to use the library’s other computer labs. All 3D printing, large-format printing, or plotting will begin once payment is received in full and in cash. We are a cash only facility and do not accept debit or credit card payments and checks. Same day printing may not be available due to demand. Printing is done on a first-come, first-serve basis. In order to obtain a price quote, you can visit the Innovation Garage with your file on hand. 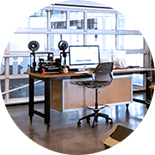 All files must be reviewed in person at the Innovation Garage before 3D printing, large-format printing, or plotting. If you are unsure about pricing or whether or not your file is set up correctly, please email us with the file for review. Emailed files are for the purpose of review only, we do not keep them to print. To move forward with your print, remember to bring it on a portable storage device when you come to the Innovation Garage. 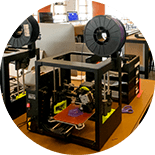 The Innovation Garage has 3D printers available for Auraria campus students, faculty, and staff. We use PLA filament and have a variety of colors. Call or visit the Innovation Garage for the most up-to-date information. *Due to the complexity of some prints, PVA support material may be necessary for the completion of a project. PVA filament is quickly soluble in water, bonds well to plastics and prints easy and ideal for highly detailed work where manually removing support material is difficult, if not impossible. 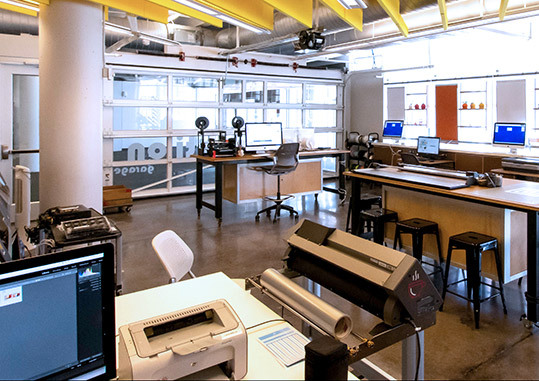 All Innovation Garage equipment is to support class- and research-related creative and academic activities of students, faculty, and staff of the Auraria Campus. As such, and in accordance with the Auraria Campus’s Weapons Policy, Auraria Library 3D printers may only be used to create objects that are directly related to assigned class or research work, and may not be used to create weapons of any kind or any other item designed to harm others in physical, economic, or social ways. The Innovation Garage has three large-format, high-resolution color printers available for Auraria campus students, faculty, and staff. 17” wide printer: Sheet prints can be made in the following size and paper options. Dimensions can be cut down. Prices are per page. 24” wide printer: Prints can be a maximum of 24” wide on premium luster photo paper. This service costs $4.00 per linear foot with pricing rounded up to the nearest 25 cents. 44” wide printer: Prints can be a maximum of 44” wide on premium luster photo paper. This service costs $7.00 per linear foot with pricing rounded up to the nearest 25 cents. Smaller artwork may be combined to maximize space. For assistance in sizing a file for printing, please visit the Innovation Garage during open hours. Design and create your own 2D stickers, decals or other adhesive vinyl graphics using our vinyl plotter. Graphtec CE6000 PLUS Vinyl Cutter Plotter: Vinyl stickers can be a maximum of 18” wide in a variety of colors. This services costs $0.25 per linear inch with pricing rounded up to the nearest inch per color. Price includes transfer tape. We’ll also show you how to weed away excess vinyl and prepare the sticker for application elsewhere. We encourage simple, one color designs. For assistance creating a vector file for plotting, please visit the Innovation Garage during open hours.